My Saturday Knitting Group: Our University Studies Person and Felix who likes the taste of her knitting. Oh! 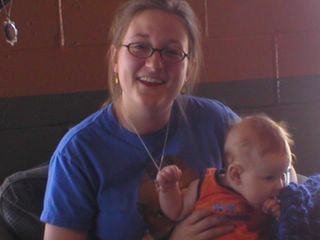 I look crazy... like no one should ever trust me with a baby! :) Nice blog and see you soon!! You crack me up. LOL. I'll bring the camera and you guys can take my pic. Yeah! You're on! See you tomorrow!